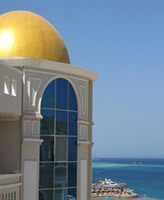 The airport is located inland, 5 km (3 miles) southwest of the downtown of the city of Hurghada (El Dahar district). It serves Hurghada, the center of Red Sea Governorate of Egypt, seaport city Safaga and a lot of amazing Red Sea beech and aquatic sports resorts: Al Quseir, Sharm El Naga, El Gouna, Al-Mahmya, Soma Bay and Makadi Bay. Route network of Hurghada consists of scheduled passenger services to the Egypt capital city of Cairo and direct connections to several European destinations. More than 40 airlines perform seasonable charter flights to the cities in Western and Eastern Europe, Scandinavia, Russia and the CIS countries. Nowadays the airport has undergone massive renovations to accommodate dramatically rising leisure traffic. There is only one terminal in the Hurghada airport and car parking is located just outside the terminal. It is possible to get to the city or to the hotels by taxi or piblic transport (minibuses). In the terminal there is the various infrastructure necessary for satisfaction of requirements of taking off and arriving passengers: restaurants and cafe, changes, phones and post office, shops of souvenirs and essential commodities, a left-luggage office, the VIP-lounge, car rental office. There are no business facilities at the airport but it's possible to use conference and meeting facilities at the resort hotels which are located only in 5 minutes by car from the airport. Hurghada airport suggests wide range of shopping possibilities before flight. A lot of souvenir shops are located at the terminal. There are also duty free shops at the departure zone selling parfums, alcohol and confectionery products with great discount. Time zone in Hurghada GMT + 2 (daylight saving time GMT + 3 from the last Friday in April to the last Thursday in September). Hurghada Airport phone number: +20 65 443 976, fax number: +20 65 443 976.